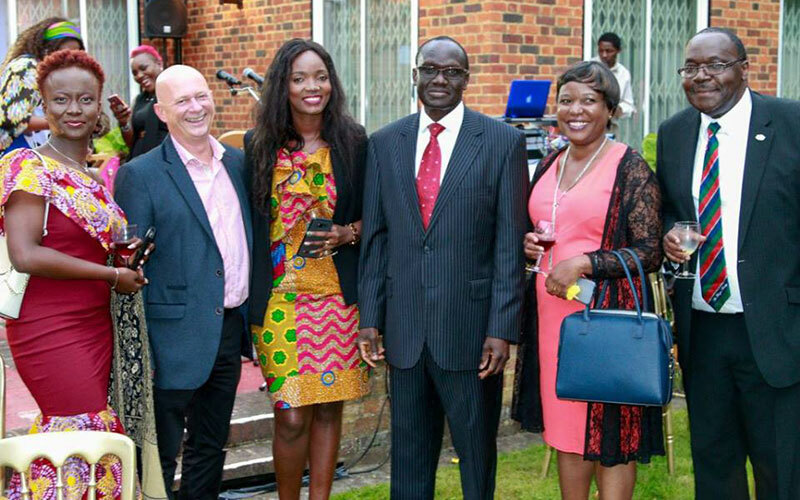 On 7th September 2017, the Kenya Society held its annual summer party the event was hosted by H.E Lazarus Amayo, High Commissioner of Kenya to the UK and his spouse Mrs. Nelly Amayo at the High Commissioner’s residence. The event was graced by the Chairman of the Kenya Society, Mr. Patrick Orr, the Deputy Chairman, Mr. Juvenal Shiundu, members of the Kenya Society Members, High Commission staff and other invited guests. Speeches were made by the Society Chair Mr. Patrick Orr, and the Kenya High Commissioner H.E Lazarus Amayo. In his address, the High Commissioner welcomed guests to the 2017 summer party and thanked the Society led by the Chairman Mr. Patrick Orr for organising the event. He noted that the Kenya Society has continued to grow from strength to strength, and the objective of fostering closer and good relations between the people of the Republic of Kenya and the United Kingdom is being achieved with the help of the organisation. In his remarks, Mr. Patrick Orr acknowledged Kenya’s recent achievements including the excellent performance of Kenya’s team that participated in the just concluded IAAF World Championships in London where it performed extremely well despite the tough competition. The team finished second in the world medal table after the USA. He also congratulated the High Commissioner for being honoured with the Freedom of City of London, the Chairman thanked members of the society for their support.